Galehead – 4,024 feet of elevation that I never thought I’d revisit but did so happily on Saturday. 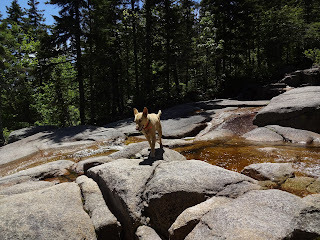 I introduced Molly (fka Rayne) in my post about the Zealand Falls Hut. Since then, she was quickly adopted, hiked Mt Crawford, and was ready to up the ante. Her dad and I discussed what was left on his 48’s list and what would be an appropriate hike for the pups, settling on Galehead. My recollection told me it was on the longer side (10.2 miles round trip) but less demanding than the others we were considering. 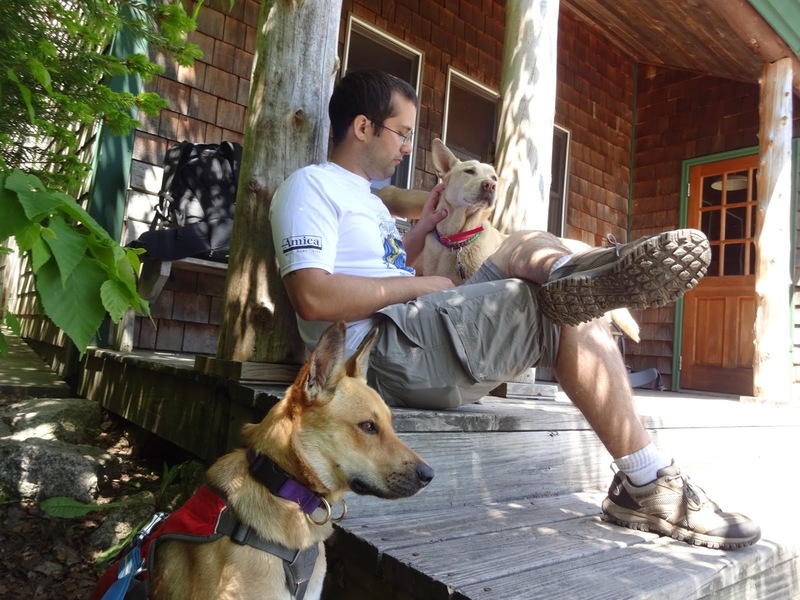 The reunion at the trailhead was something I rarely get to be a part of and put a huge smile on my face (and a few pawprints on my shirt!). We headed into the woods a little after 8:00 at a decent pace thanks to the initially mild elevation gain and relatively good footing (mostly dirt, increasing roots and low rocks as the trail progresses). 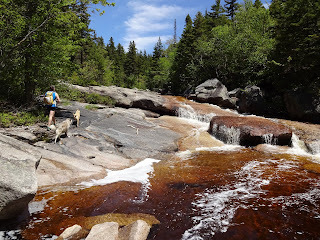 There was plenty of water for the dogs and several easy crossings (mostly step-overs). 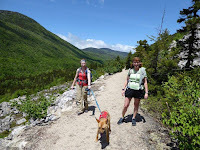 Aside from one steep section towards the terminus, the Gale River Trail has one of the most even and moderate inclines of the NH Four Thousand Footers. 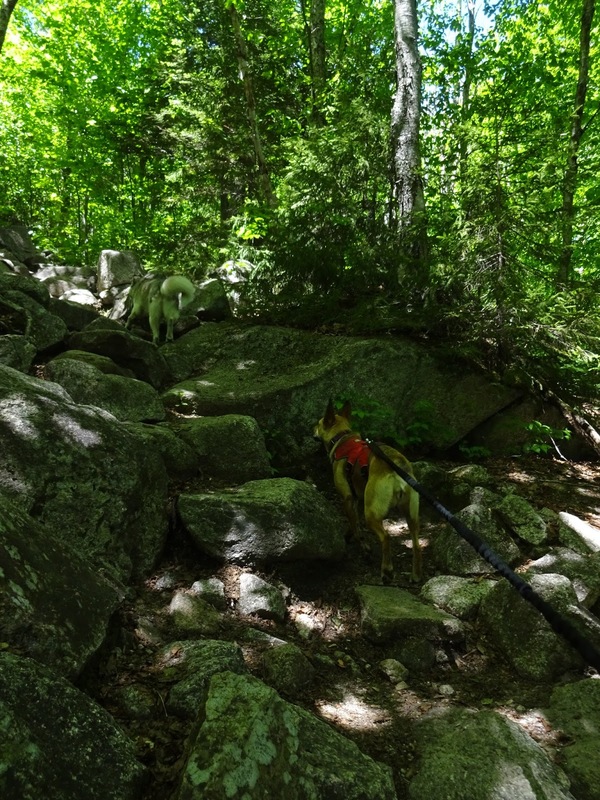 The terrain becomes increasingly rocky but we lucked out after a rainy week and enjoyed dry trails where it counted. Don’t worry, the dogs got plenty muddy on the lower sections! At the intersection for the Garfield Ridge Trail, we took a break and met the first of the many flies we would encounter throughout the hike. The trail then descended briefly before heading up to the Galehead Hut. 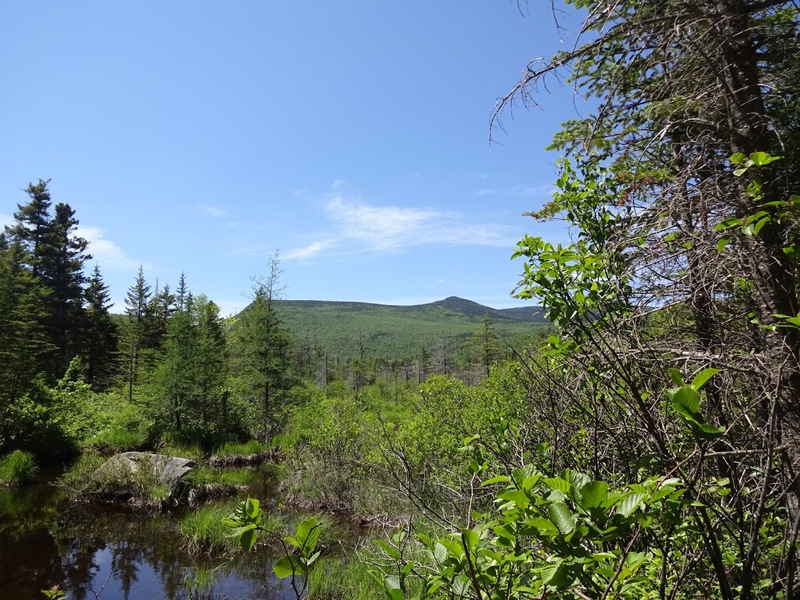 This one is a favorite for the broad “front yard” and views of the Pemi Wilderness and what we believe was West Bond. The other hikers there had many stories and love to give the dogs. 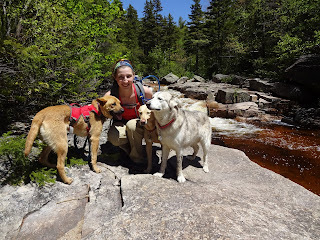 We hung out for a bit, tucked away our packs, and headed off to the Frost Trail for the official summit. It was glorious to be pack-less and the walking was quick. We did our obligatory summit photos (#1 for Molly and #25 for Dan!) then turned around. 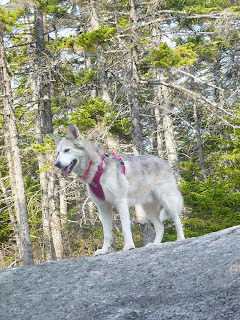 There’s a viewpoint along the way that we stopped at and the dogs had great fun leaning over the edge. 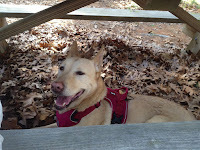 Molly then plunked down and whined the “let’s go” pout. I nearly fell over snickering at her, pathetically squatting in the dirt and acting so much like Ty. 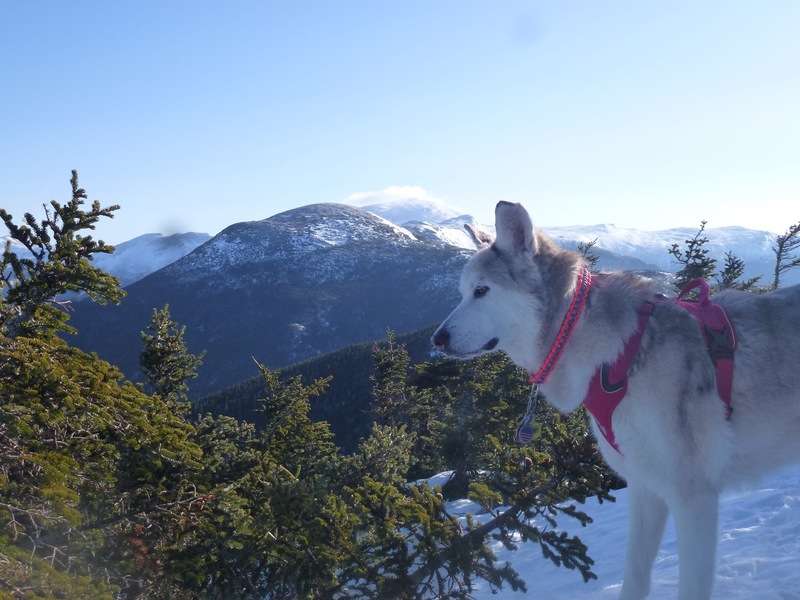 I don't always look this awesome, but when I do, I'm on the trail. Back at the hut, we continued to enjoy the beautiful weather on the porch while the dogs shamelessly garnered all the attention they could. I even passed my card out to a couple of folks who might be looking for a four legger to accompany them on hikes! 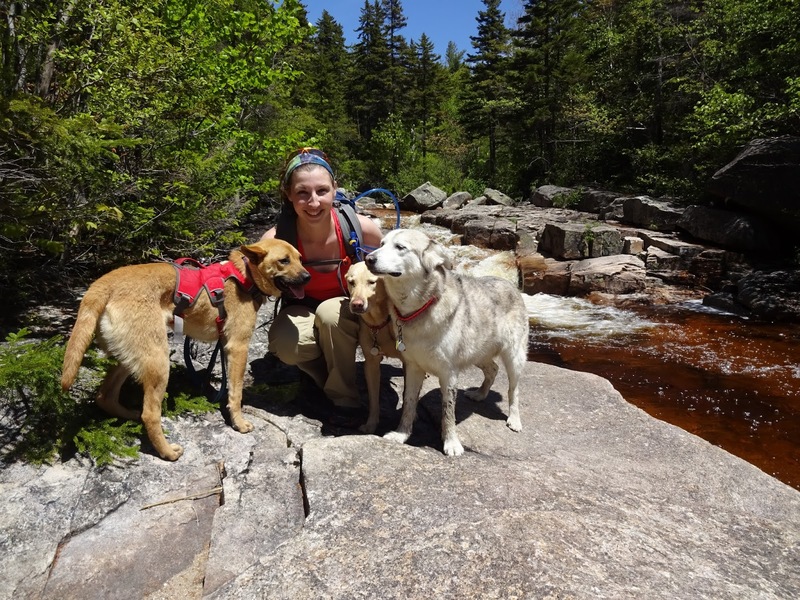 I’m always grateful for the welcoming nature of other hikers with the dogs. 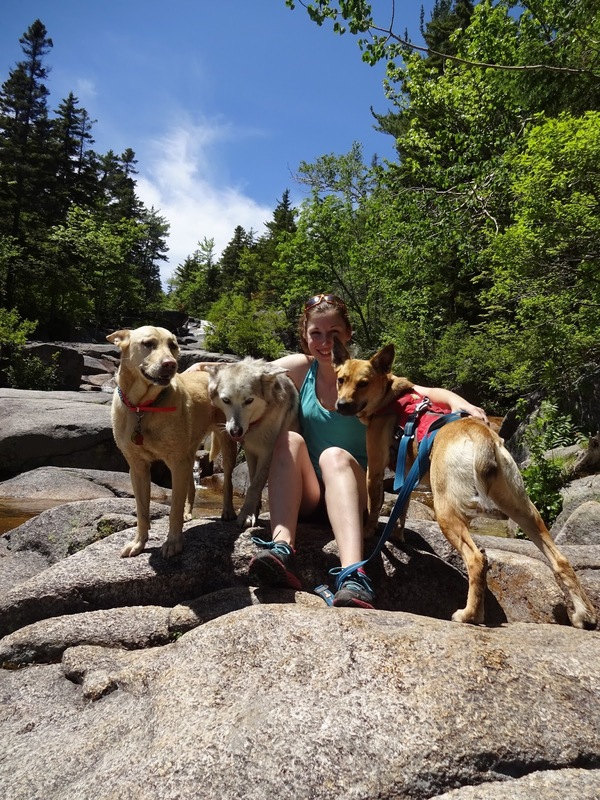 The rule of thumb for us is “don’t greet until I give the okay and for dog’s sake, don’t beg!” That usually goes right out the window because many hikers return the dogs’ enthusiasm for interaction. 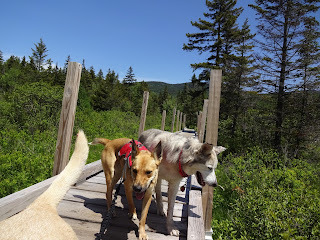 It’s still important for them to listen and not be obnoxious though, as we have met dog-wary hikers and it is always humbling when they compliment us on their manners or tell me not to worry about letting them wander due to their calm demeanor. 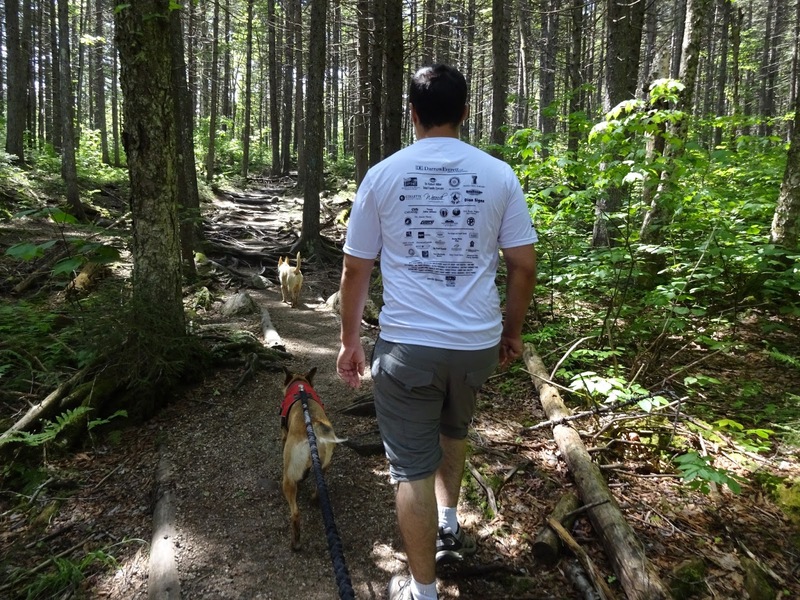 There are not many places left to allow dogs off leash so we do our best to make a positive association between dogs and trails. 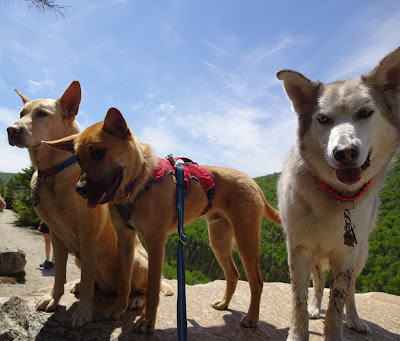 The other dogs we met were also awesome hikers! After the hut, the story is all downhill ;) We loaded up and headed down, stopping on occasion to enjoy the running water (read: wash dirty Miss Molly!). The downhill trek passed as quickly as the climb and we were back at the trailhead around 3:30. (When we were moving, it was at a decent pace but found many reasons to stop and enjoy!) 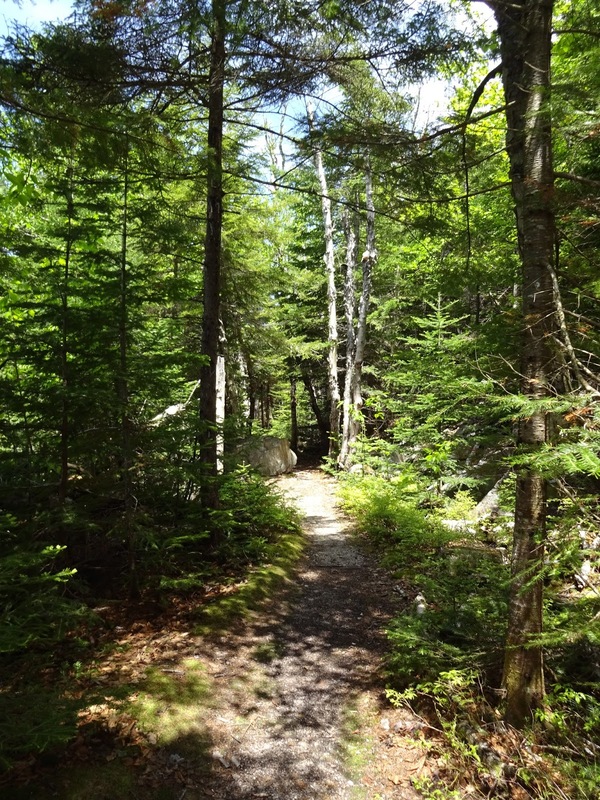 As much as I suggested this hike for its trail qualities, the big takeaway for me was the interaction with others. 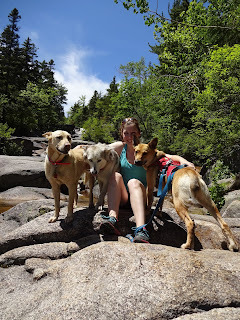 I am very fortunate to keep in touch with many of my adopters and get to see some of my previous fosters on rare occasion but never have I gotten to hike with one with her new family. 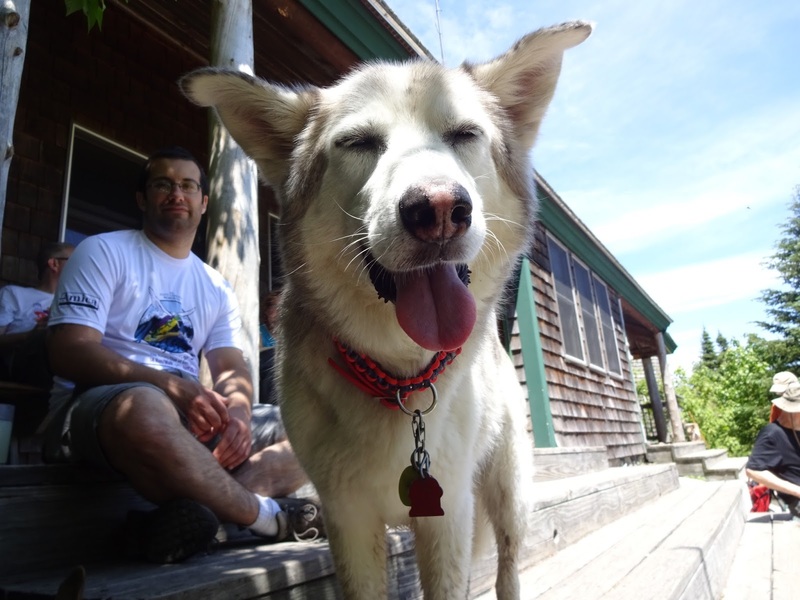 For a dog we fell for – hard and fast – it was very special to see her again and see how bonded she is to her new dad. 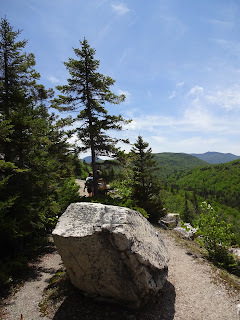 I was also blown away by how many folks from the Facebook hiking groups we met today. In the past, we might’ve met one or two, if any, but Galehead's numbers exceeded all past hikes! 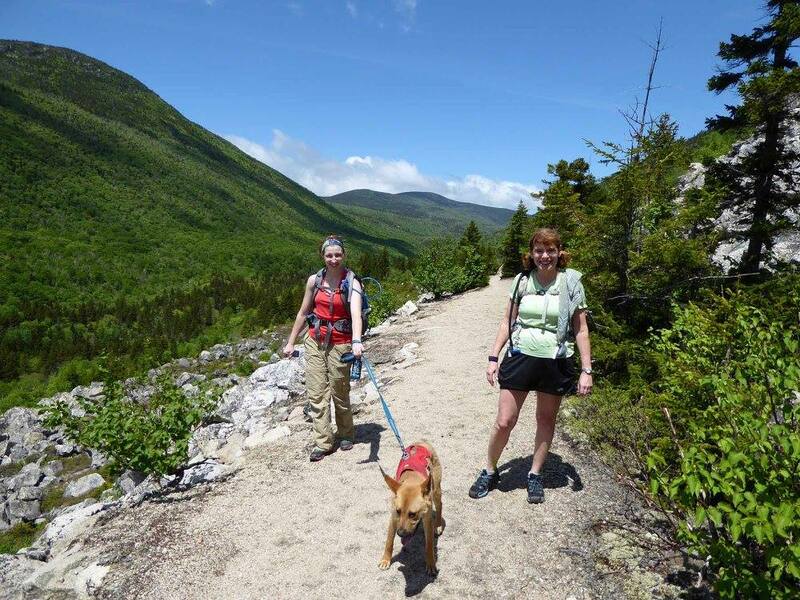 The hiking community is big and welcoming and it’s a cool feeling to put faces to the profiles. The dogs even made it into other hikers’ posts! shorter summit for our next adventure! They say that people should have one article of clothing that is their “go-to.” It is versatile, always stylish, and works in a variety of situations. I’m calling our Hurtta Active Harness the dogs’ “go-to” piece. 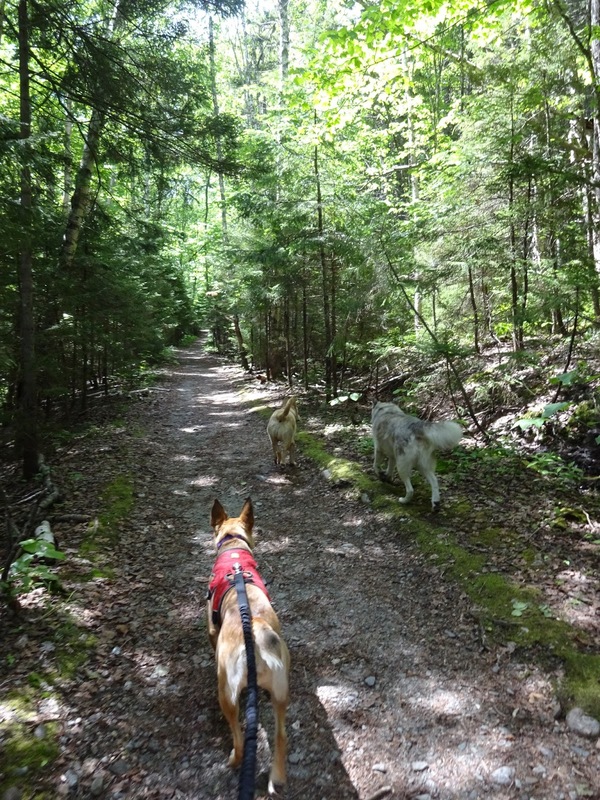 Backcountry K-9 sent us a cherry red harness in the early spring and both dogs have been wearing it from the trails to the pavement ever since. It’s soft yet tough padding hasn’t shown any wear in the few months we’ve had it and it has provided safety and comfort to the dogs. 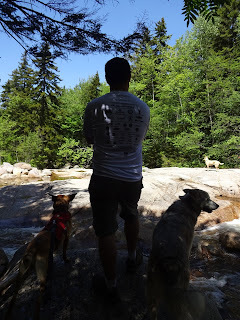 I’ve been really happy with the harness’s “best of both worlds” functionality; it has enough features to be a hiking harness but is simple enough for every day and other creative uses. As the snow melted to mud and finally dry dirt, Tango sported the Active Harness on the trail regularly. 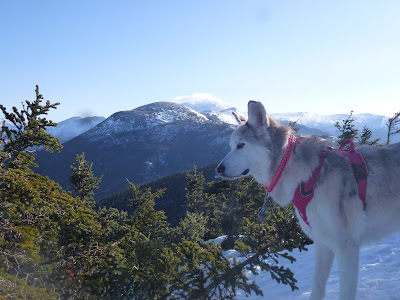 The handle was really easy for me to grab him on short notice, such as to move him to the side of a trail narrowed by deep snow for another hiker to pass. The material is super durable and withstood plenty of sideswiping trees and rolling on rough surfaces. As the days warmed, Tango seemed genuinely pleased with the harness’s low profile. 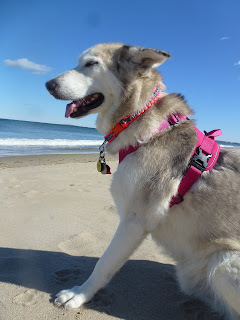 It does not cover as much of his back as his other hiking harness, which meant less trapped heat. 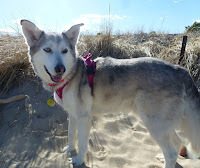 Warmer weather also meant the critters my two are famous for chasing were coming out in droves and the harness provided visibility when he’d shoot into the thick woods. 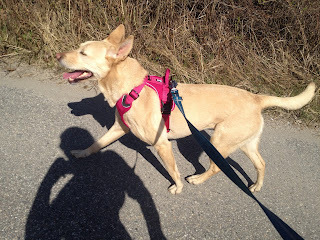 I’d say we’re both pleased with the Active Harness! While Tango got to strut his stuff in the woods, Ty made good use of the harness for jogging. Jogging as a concerted effort was new to us this spring and we got to do two races together before I pulled the plug for the summer. I prefer she wear a harness for safety when jogging and the Hurtta one is perfect. The handle was great for hanging on to her at the busy start lines; getting her revved up then releasing her added to the excitement! 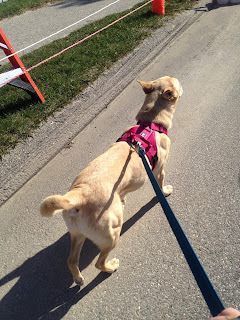 The chest padding was perfect for our jogs. I can see how it would be good as a car harness as well, although we didn’t try it ourselves. When she did plunk down in the car, it was easy to take it off without making her get up again with the side clips. 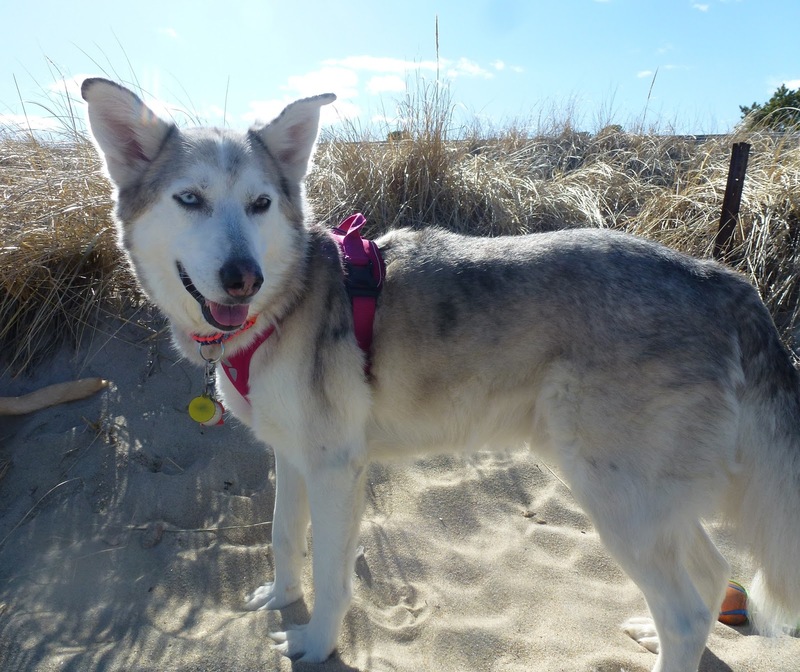 (Also helpful for foster dogs who are becoming accustomed to handling.) 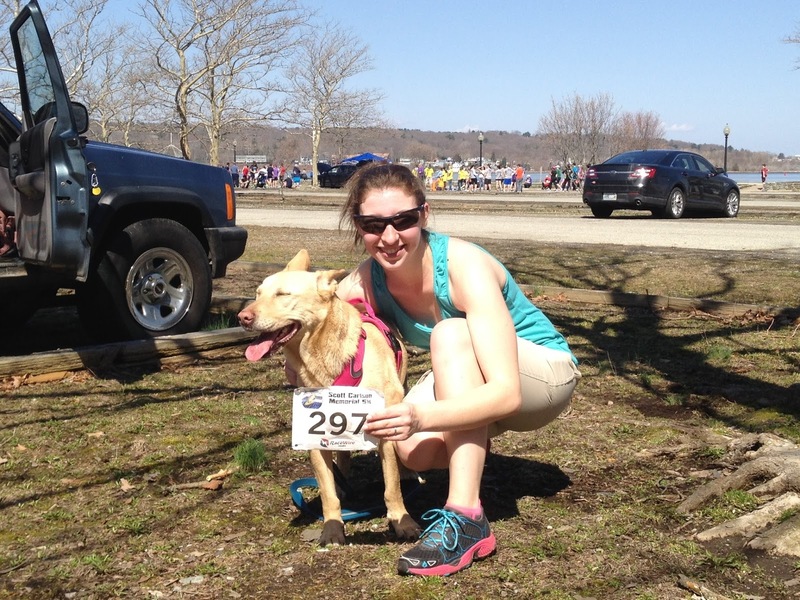 Ty moved freely and comfortably for our 5K’s and practice runs. I have to say, she also looked pretty darn good! 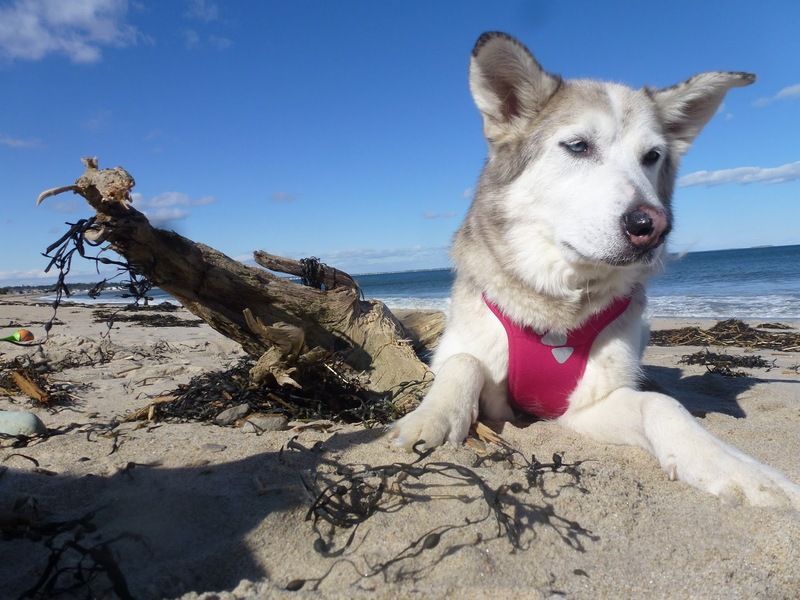 So – a harness that fits a wide range of dogs equally well; comfort, quality, and durability; and its readiness to be used in a ton of different situations – can’t go wrong! As promised, a description of another fine Zealand Trail hike! 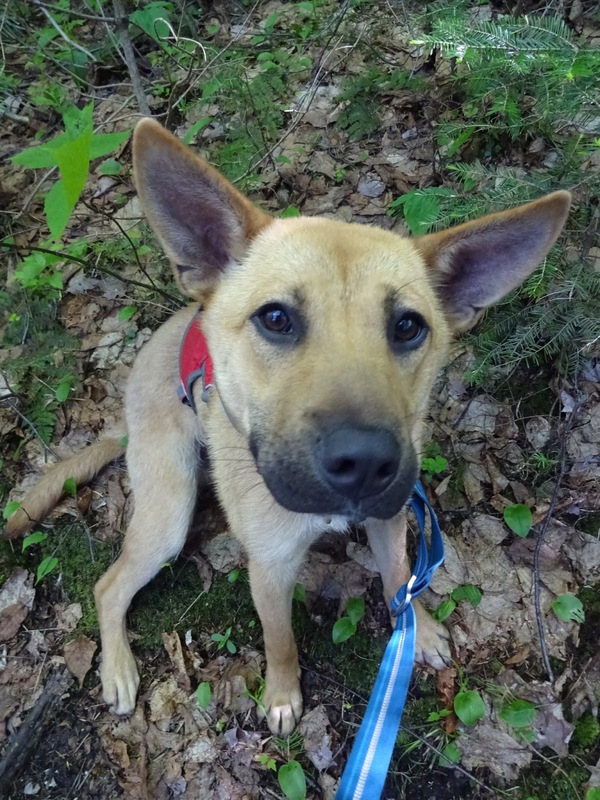 Mr. Yogi went to another foster home on Saturday and we had the opportunity to bring a beautiful Carolina Dog named Rayne with us this time. 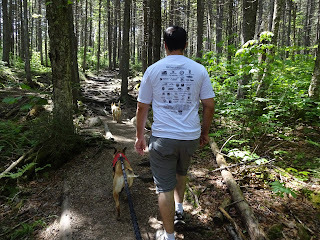 Our feet hit the ground at the same starting point at last weekend: the Zealand Trail, this time with the whole family – my non-hiking husband was with us! The trail begins smooth, flat, and promising. Keep left of the big AMC sign and don't head up the overgrown hill like Ty always wants to do! 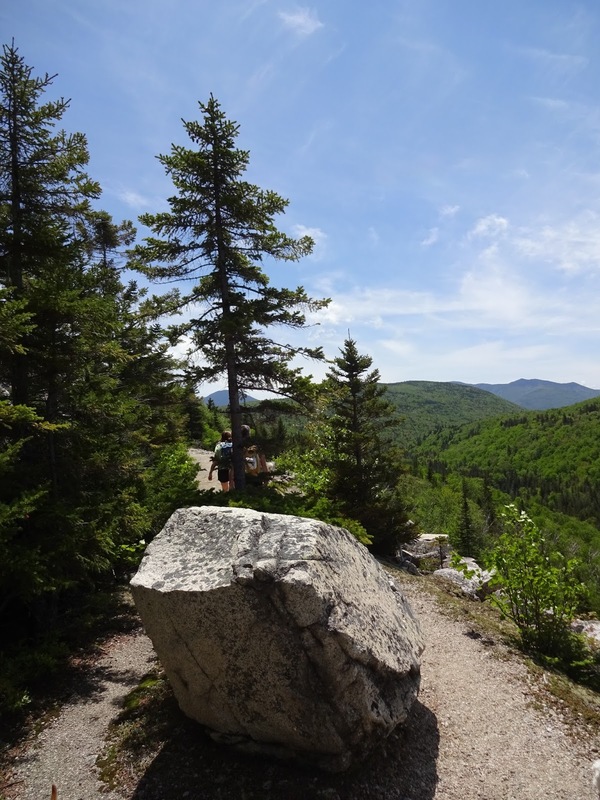 After a short walk, you will see a trail over to the left with a birch sapling laid on the ground and a ski trail sign on the tree that I miss every time. 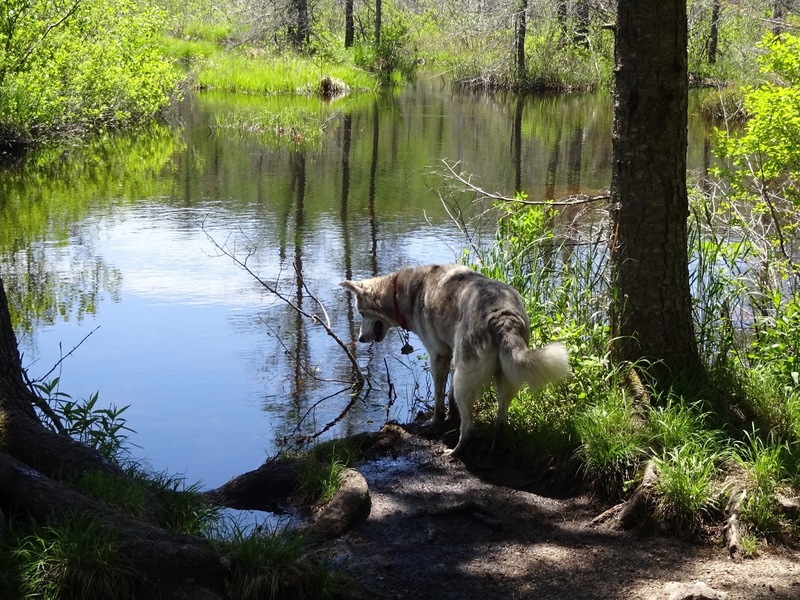 If you’re more observant than me, you will stick to the trail without issue. There are a couple easy water crossings and bridges on this trail and elevated boardwalks that provide beautiful views of one of the beaver ponds. Shortly after the elevated boardwalk is the intersection for the A-Z Trail, which heads over the Mt Tom. Continuing on, we crossed a broad bridge over Zealand Pond and skirted the side of it over to the junction with the Ethan Pond Trail for the hut. At this point, we had gone 2.5 miles. The majority of the final .3 miles is a rocky but moderately steep incline. My husband is not thrilled about it but it is very doable. Zealand Falls Hut is popular for families and we saw quite a few young hikers developing a love for the mountains while we were out. We skipped it this time but just as the steep section starts, one can see the falls through the trees and follow a quick detour to view them or sit on the rocks and enjoy the solitude if inspired to do so. Then, ta-da, we arrived at the hut! 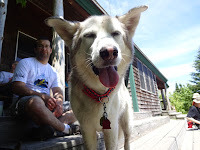 There’s not as much space around the hut as some others like Mizpah and Galehead (relevant because we try to stay out of the way with the dogs) but there is enough room for visitors to spread out on the hut’s benches, stairs, and short log seats across from the hut. 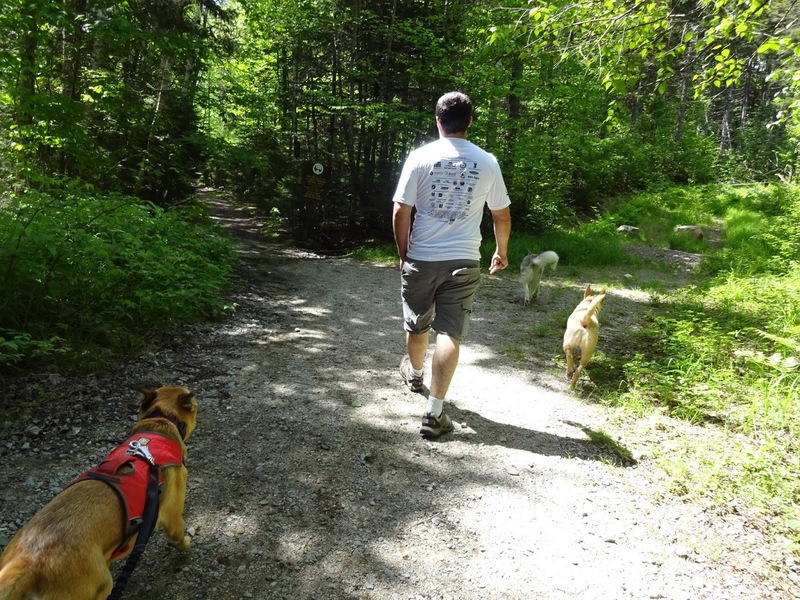 Among the dozen or so human hikers, there were six dogs total, half were ours! The hut serves soup, lemonade, a couple bakery items, and maybe some other simple but tasty treats. The Hungarian mushroom soup was delicious! There are also bathrooms. While there is room inside (and the friendly croo!) 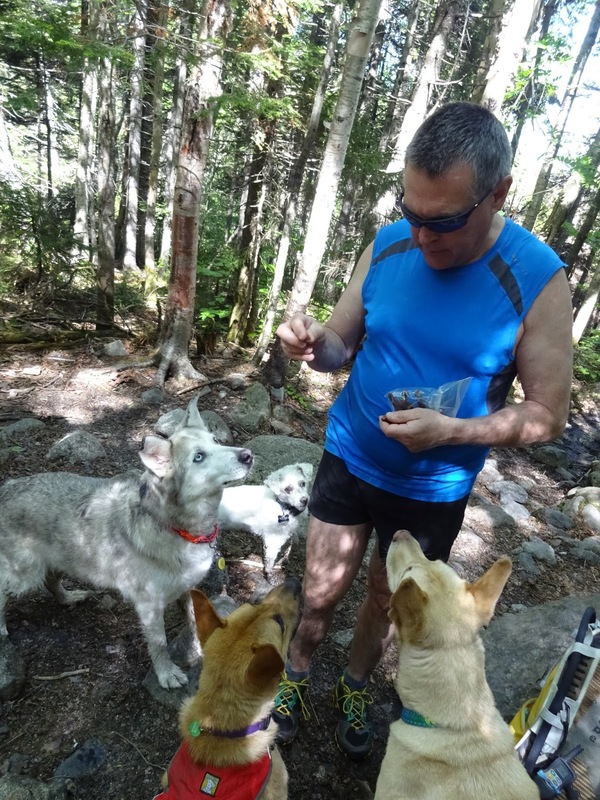 we always snack outside because of our four legged companions. 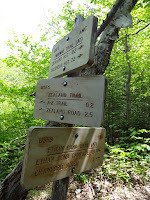 Past the trail sign at the hut by a few strides is Zealand Falls. 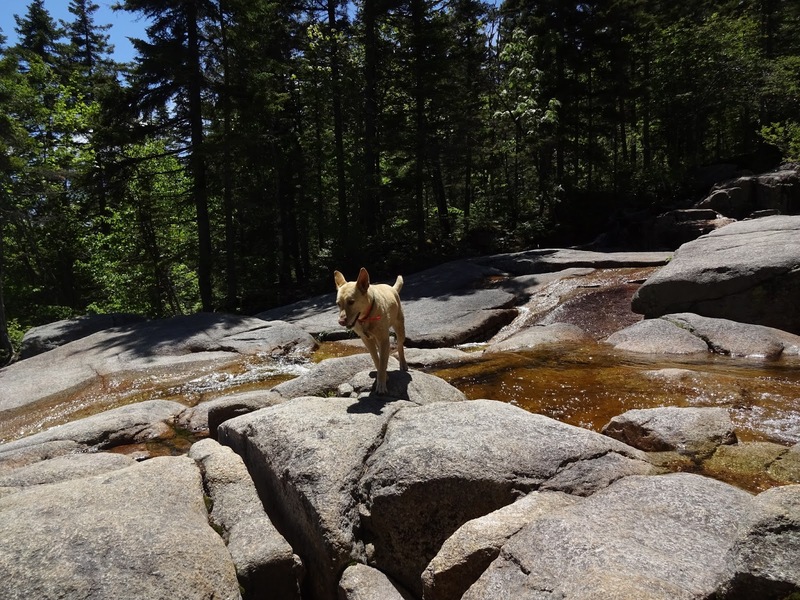 For all his caution on the rocky trails, Erick has no problem stepping out onto the falls. 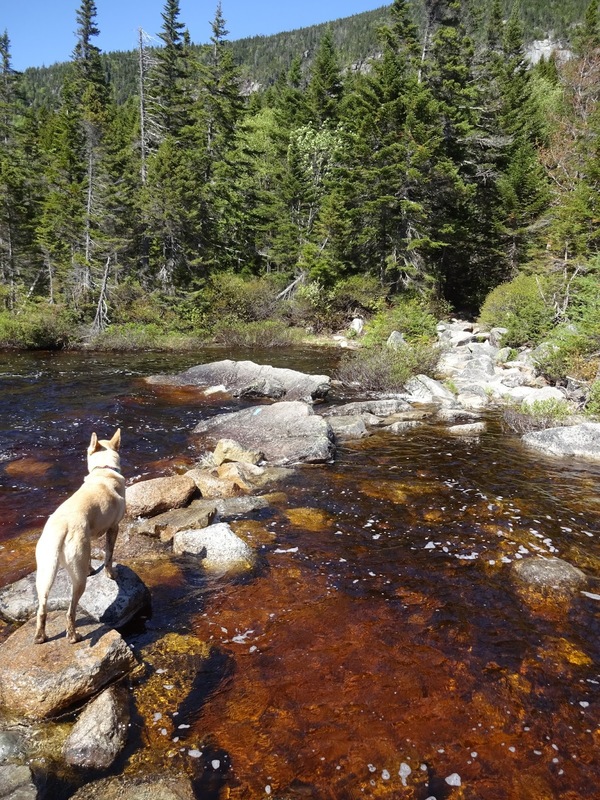 I'm comfortable with my adventurous pups crossing the water and was pleased with Rayne’s natural caution but folks with green hiking dogs or adventurous children would benefit from knowing what to expect. After subjecting everyone to photos, we packed up and headed back down. I love this hike for everything that it offers. My husband concurs that it is a great hike for those who are new to hiking or have limited interest in day-long or rocky excursions but still want to hit the trail. The food is also a great motivator! We generally spend about 4 hours total on this hike, including a break of about a half hour at the hut. 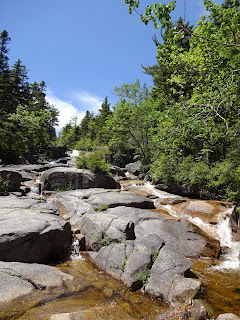 I get the views and out-in-nature, happy-fuzzy feelings I need but when I’m itching for more, can head down the Ethan Pond Trail afterwards or up to Zeacliff (or further) for the views and more challenging terrain. 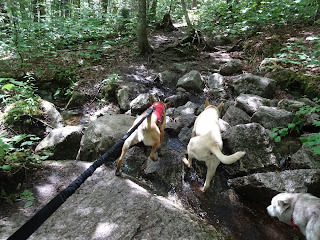 The dogs have plenty of excitement; water access; great socialization (interestingly, lots of people at the hut, few on the trail); and an easy hike for the hot days, those new to hiking, days they're tired but still want to get out, etc. Win-win-win! 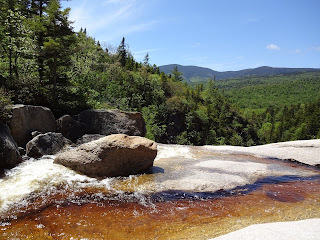 A long post for a pretty short hike but, if I had one go-to hike to suggest to nearly anyone, this is the one! We've been tuckering ourselves out before I can manage to write about it for the last couple of weeks! I regret not recording our epic Memorial Day weekend, as it was full of dog-friendly fun with family. 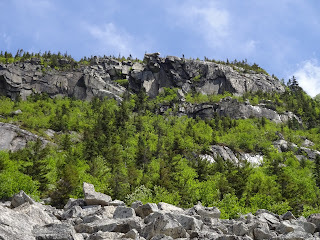 Someday I will make some notes about our hikes up Sawyer Mountain (Limerick, ME), Tom/Field/Avalon (Whitefield, NH), and more of the Eastern Trail (Saco, ME). Last weekend we picked up and got our little foster pup, Yogi, settled in and worked on expanding the fenced portion of the yard. But it's awfully early for digressions, so here we go! Yesterday, we went on a phenomenal 9.5 mile traverse that began with the Zealand Trail and ended at the Ethan Pond Trail/AT where it meets 302. Longer, by our current standards, but easy mileage - this is a great hike for those who are comfortable with the distance but not looking for a day of elevation gain. 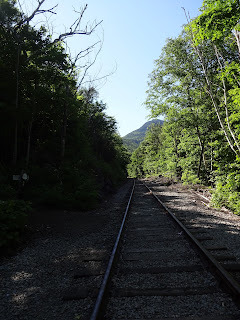 It also has some of the most unique scenes and vibes we've encountered and I am forever in love with the portion that walks along where a slide and railroad bed converge (thank you Bob and Geri for the history lessons!). 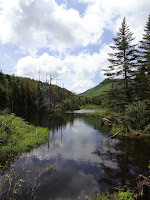 Under cloudy skies, we reached the Ethan Pond Trailhead around 9:00 for the car spot. By the time we parked on Zealand Road, the sun was already promising to come out. The walk to the junction for the hut (which is just beyond, after a very brief, steeper climb), is a meander, mostly over dirt trails, that travels through woods and opens to beautiful beaver ponds. 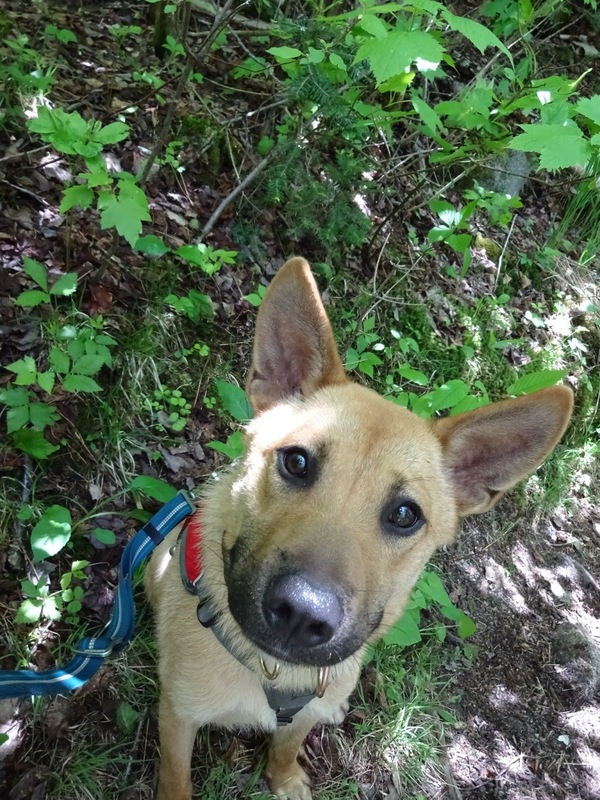 For the record, if your dog is prone to giardia, keep an eye on him/her, as even our iron-tummied Tango has gotten himself into trouble when he traveled this trail.... And if you have a dog who likes to sniff out beavers and deer-hop through the tall grasses to find them, again, keep an eye on her! 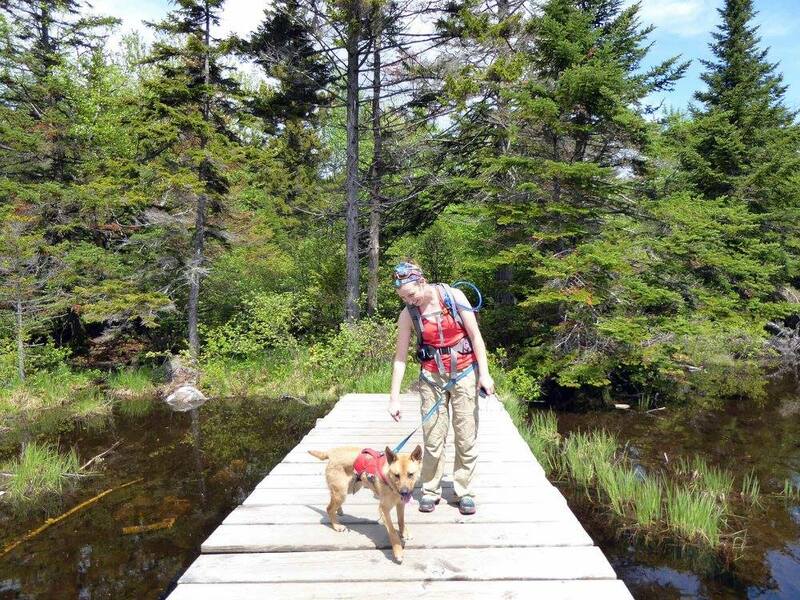 There are beautiful and well-maintained raised boardwalks that carry hikers over the marshy fringes of the ponds. 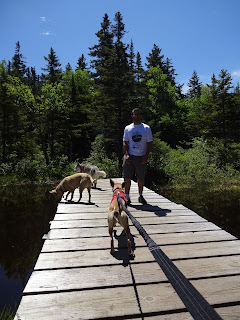 From there, we turned on to the equally footing-friendly Ethan Pond Trail (also the AT). 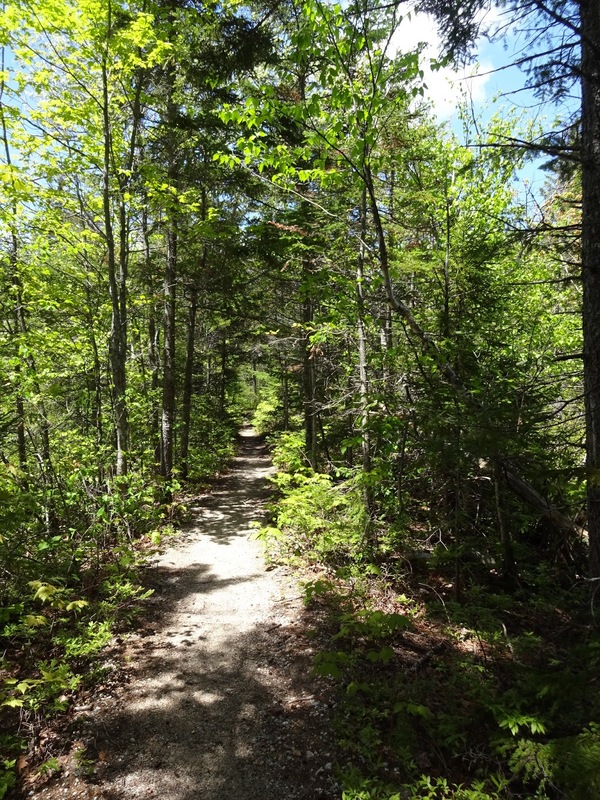 The trail is often "one lane" but is still generally hard-packed dirt. This led us out to one of the most surreal views I've been fortunate enough to experience (and under bluebird skies at this point!!). No majestic Mount Washington, no endless views, but equally iconic to me. As I'm told, the trail is an old railroad bed. Close to the junction for Zeacliff Trail (the wilderness sign is visible below, adding to the remote feeling), the trail breaks from the trees and becomes an awe-inspiring walk through the notch. 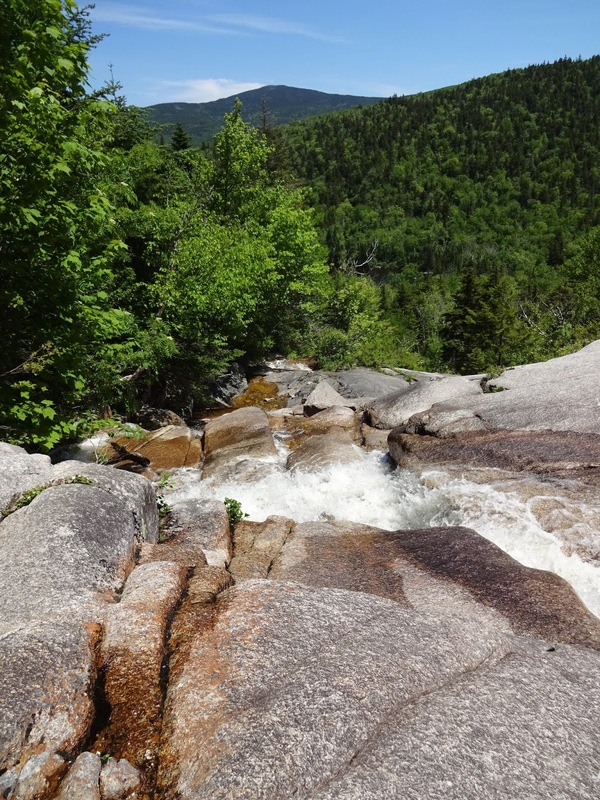 Above and below are the consequences of a slide - huge boulders covering the land that the trail traverses briefly. travelling southbound, to the right is Hale and Zeacliff (another fave!) and to the left, Whitewall looms above. 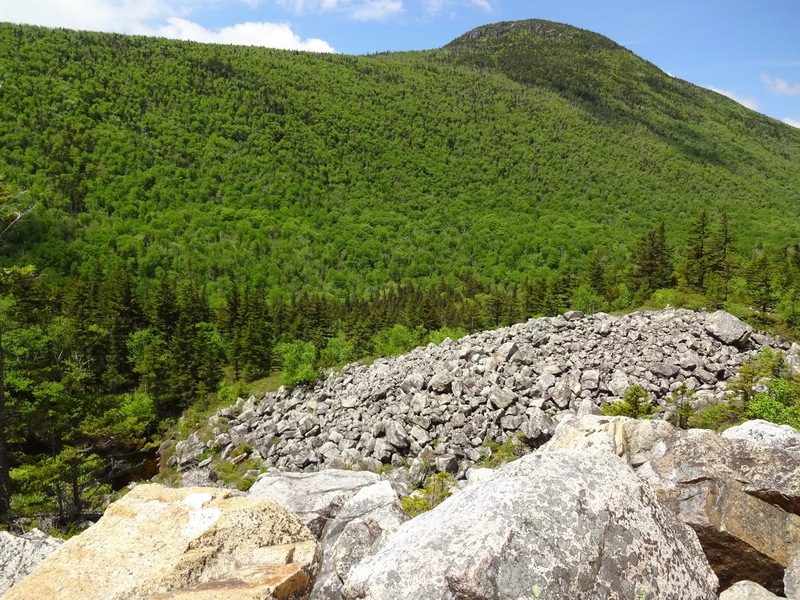 The combination of being between such great masses, the broad, open trail, and boulder field is unforgettable. 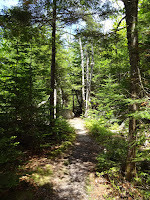 Continuing past the junction, the trail resumes its flat progress through the woods to the Thoreau Falls Trail. It is a little wider than before the views and sparsely covered by gravel, reminding me of comments from western hikers or maintained state park trails. 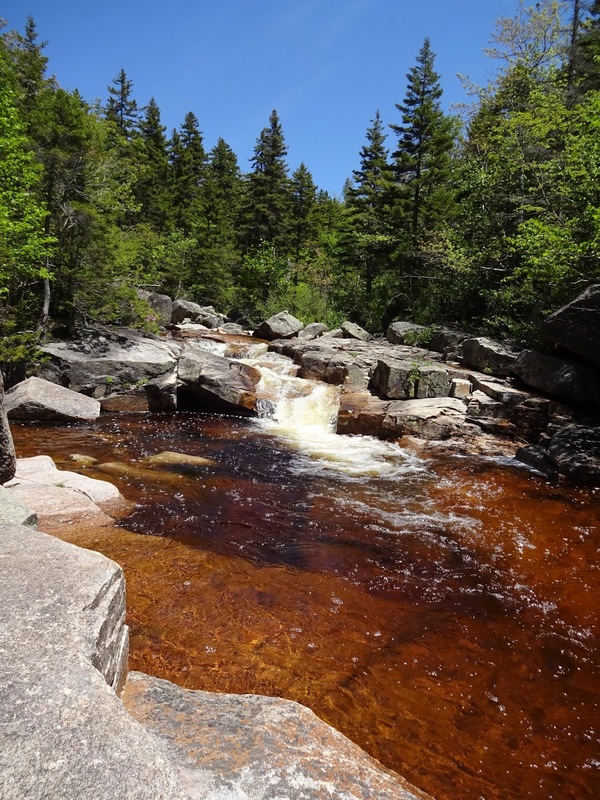 The falls is a mere .1 mile detour. Do not skip it or Tango will hunt you down and eat your pb&j because it is worth it!! The falls are intimidating and breathtaking. Take care with adventurous or "green" trail dogs. 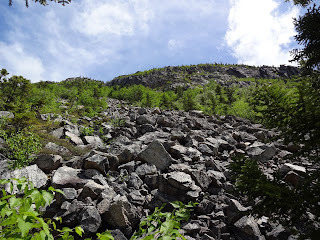 Some time after the junction for the Shoal Pond Trail (really, could be a mile or afterwards based on my terrible memory), the footing became more White Mountain-esque - rockier and muddier. 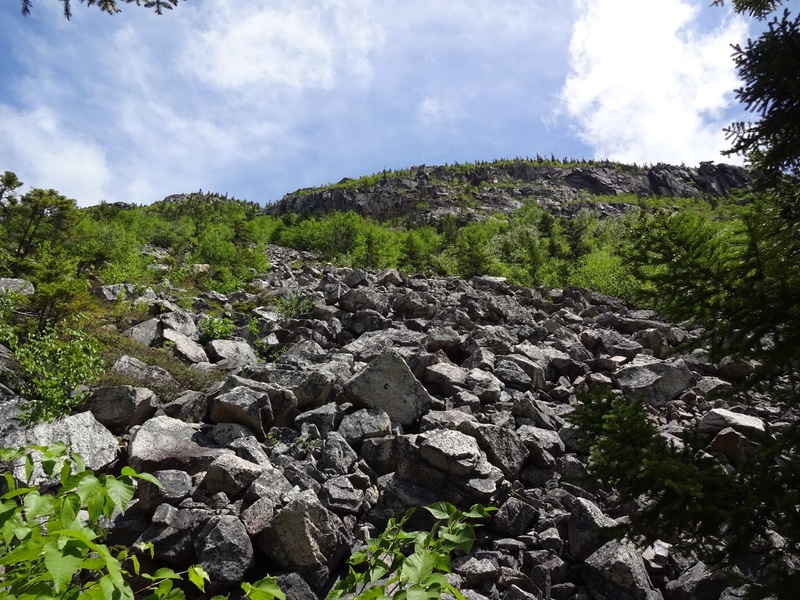 Still no (discernible) elevation changes and the embedded rocks are easily walked on/around. There a many boardwalks to assist with the mud and standing water. We took the spur marking the Ethan Pond Shelter for our last scenic detour. Ethan Pond is gorgeous; sure there are many beautiful ponds out there but this view is uninterrupted and earned making it that much more breathtaking! 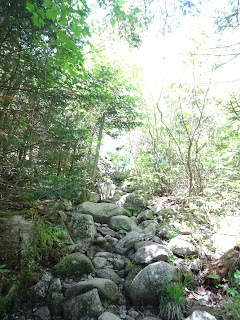 The trail to the hut is partially submerged and a small blue blaze on one of the boulders marks the way. We walked out onto it for photos and turned around. The trail continues with the same terrain and begins losing elevation as we made our way towards the last couple of junctions. Not many photos, as we trail jogged whenever we could to appease the pulling Yogi. I haven't mentioned him much but he is the new blondie in the photos. 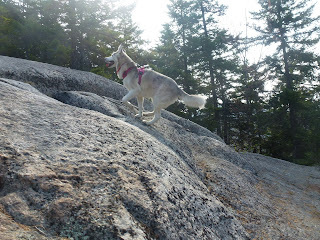 At seven months old, I was fully prepared to carry him when needed but was genuinely curious how he'd take to the trails because we haven't done too much with him in the short week we had him. That young man pulled for the whole trip (minus the brief carrying stint when he fell asleep nuzzled into my shoulder)! He LOVES the woods and was not keen on being in last place. He also has a humorous aversion to water. Not much to report after that. The trail became more family-friendly as we hit the spur for Ripley Falls, crossed the tracks, and dumped back at the parking area at the end of the road. I hadn't expected to be hiking on National Trails Day but a fortuitous change of events, kind invitation, and an "I can finish the fence after the hike" attitude (almost accurate, as it turns out!) turned "homebody weekend" into an exploration everybody enjoyed. 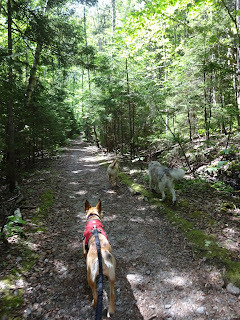 Tango loved being with the pack and easier grades, Ty and her buddy Dusty lead the trip, and Yogi got to hit the trail for the first time. 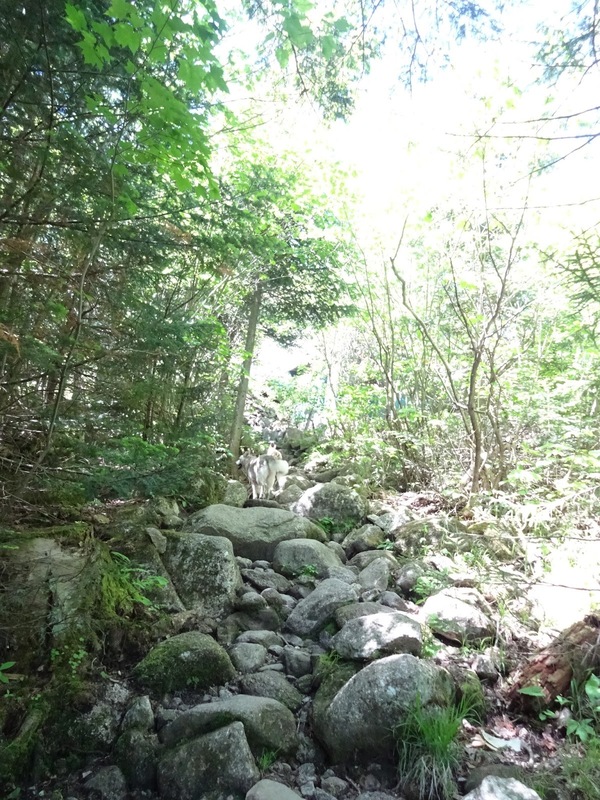 In terms of elevation, this is a very easy hike. And I truly mean that, not like some other posts where I have looked back and thought it to be a very relative term (despite my best efforts at the time)! 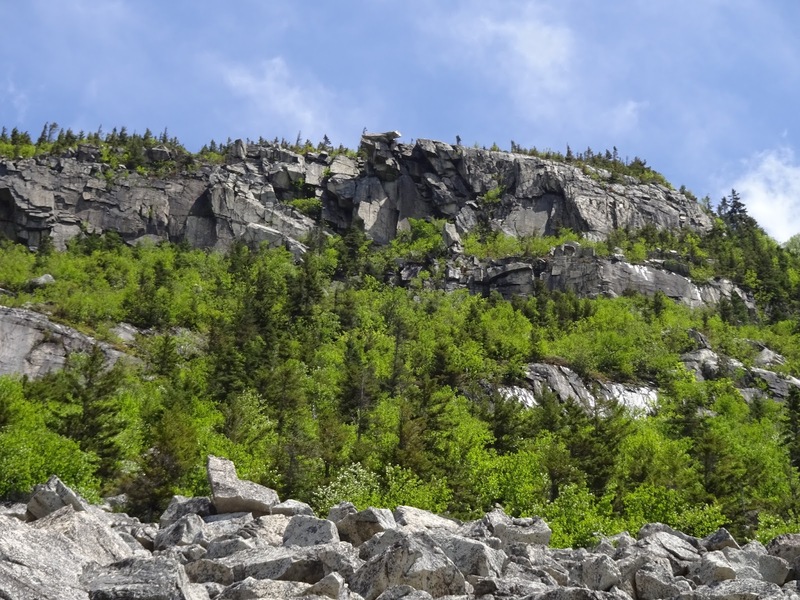 There are multiple options to shorten, extend, or modify this hike to fit one's interests and I'll be writing about one such option - the Zealand Falls Hut - next week as well as scouring the interwebz for a weekend backpack opportunity. For when one wants the quietude and distance of a longer hike but not the difficulty, I highly recommend a hike like this! **Thanks to Bob and Geri for allowing me to use some of their photos!